#1 New York Times best seller! Booklist Editors' Choice 2015 - Youth! Named a "Best Book of 2015" by Time Magazine, School Library Journal, Barnes & Noble, NPR, PopSugar, The Millions, and The News & Observer! Simon Snow is the worst Chosen One who's ever been chosen. That's what his roommate, Baz, says. And Baz might be evil and a vampire and a complete git, but he's probably right. Half the time, Simon can't even make his wand work, and the other half, he starts something on fire. His mentor's avoiding him, his girlfriend broke up with him, and there's a magic-eating monster running around, wearing Simon's face. Baz would be having a field day with all this, if he were here--it's their last year at the Watford School of Magicks, and Simon's infuriating nemesis didn't even bother to show up. Carry On is a ghost story, a love story and a mystery. It has just as much kissing and talking as you'd expect from a Rainbow Rowell story - but far, far more monsters. 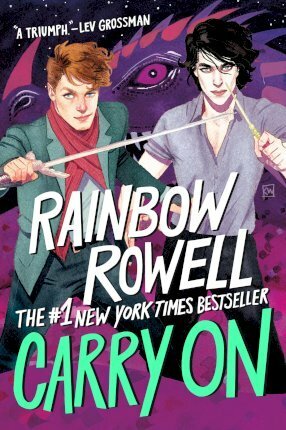 Rainbow Rowell writes books. Sometimes she writes about adults (Attachments and Landline). Sometimes she writes about teenagers (Eleanor & Park, Fangirl and Carry On). But she always writes about people who talk a lot. And people who feel like they're screwing up. And people who fall in love.